Ingrid Caduri collects sea glass from the Panama Canal to craft these shimmering earrings. We'll never know the story behind this sea glass. It could have fallen overboard an ancient ship. Or maybe it chipped off a bottle with a message inside. Today, it shimmers in your ears. 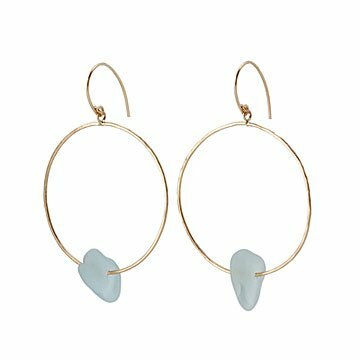 Ingrid Caduri handcrafts the jewelry using sea glass she found on the shores of the Panama Canal. Each piece is hand-selected from her collection and placed in 14-karat gold filled metal. Send it to a beach lover or anyone that feels the call of the sea. Handmade in California. 1.5" Dia Glass: .5" Full Drop 2.1"